PROFESSIONAL MOBILE web designS for Smart brands. Can you afford to miss almost one third of your website visitors? Mobile website design in Ahmedabad is one of the latest trends that many business owners follow today. One of the best way to get your mobile website done is through Web Design Ahmedabad Company Brand Core Media. Can you afford to miss almost one third of your website visitors? Mobile website design in Ahmedabad is one of the latest trends that many business owners follow today. One of the best way to get your mobile website done is through Web Design Ahmedabad Company Brand Core Media. We are an integrated web design & branding agency in Ahmedabad. We design and develop mobile websites with responsiveness and better UI/UX for companies to stand out. We are professional and experienced mobile website design company in Ahmedabad. Do you know that almost one in three website visitors around the world are coming through the mobile web browsers? And almost half of them take their decision based on their first visit or small survey done on the mobile. And in any case organisations with serious business objective through online traffic can not neglect the need of professional web design company in Ahmedabad. Most of the times people do researching work on their smart phones and based on their first few clicks they take decision to go ahead or reject certain option. Any marketers or service providers in Ahmedabad today cannot afford to loos such decisions, because that’s really a huge market and gaining momentum day by day. And as a business owner in Ahmedabad if you are not onto the list of such visitors, you are missing out one of the big pie of your business and ROI. 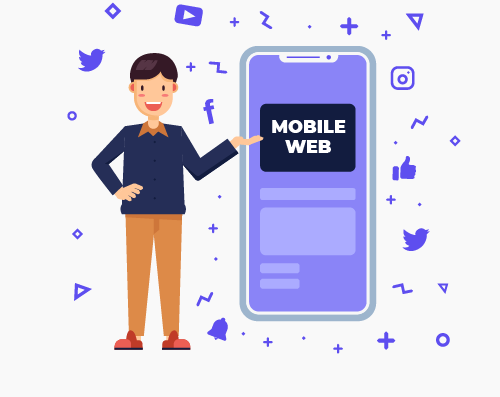 There are still limited businesses actually opted for developing dedicated mobile website design in Ahmedabad, this seems to be an opportunity you can take advantage of right now. However, designing a mobile website is one of the critical decisions you can take for your business, it’s not something that difficult as you might thinking about. We are web design Ahmedabad company that can take entire responsibility and deliver you a mobile site that generates plenty of new visitors. Many people are calling mobile website is the new frontier for welcoming leads to your website. And we lead the new way in Ahmedabad for mobile website design and optimization. Our team of design and development is well experienced and obsessed with utilizing new technology on smartphones. Also the web development process is well supported with advertising strategy, user experience and relentless testing to make sure we are on the top of the game always. THERE ARE MORE TO MOBILE WEBSITE DESIGN THAN SIMPLY MAKING SOME CHANGES ON YOUR CURRENT SITE. While developing a mobile website for you, we also..
Auto redirects people to your mobile website when they are surfing from smaller screen. In actual creates a mini version of your website that is custom coded for making it easy to navigate on a various resolutions. Our Ahmedabad mobile web design team ensures that your design is well optimized with call-to-action buttons so that it can direct people to take immediate and positive action. Have well design forms and user entered data collection system so that data can be entered easily on mobile phones and tablets. Highlights the main parts of your core website so that your message on mobile platform goes strong and clear. Optimized it for mobile rankings. Hey! Are you looking for mobile web design company in Ahmedabad? GOT ANY CLUE FOR MOBILE WEBSITE DESIGN? IT DOESN’T MATTER EVEN IF YOU DON’T HAVE IT. A site with easy interface and optimized usability. Built on a reliable platform. We test all functions and navigation before releasing it. Design build that is consistent with your branding and business image. It helps you generate leads with clear call-to-action button. Even if you don’t have an idea for mobile website design but still want to make it happen then don’t worry. Our designers and developers will create a concept that you and your targeted visitors will love. We help you to catch up the power of mobile website even if you don’t have any clue in your mind right now.